Chicken noodle soup is a classic winter comfort food loved by both adults and children, and has many health benefits as well. 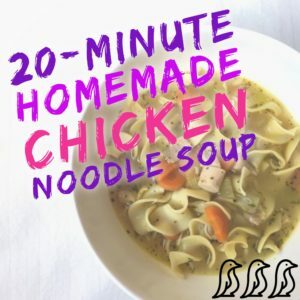 This version is ready to eat in only 20 minutes! Make a large pot to share with friends, or freeze smaller portions to enjoy later. In a large stock pot over medium heat, melt butter. Add carrots, celery, onion and garlic; sauté 2-3 minutes. Add chicken broth, chicken, and spices. Bring to a boil. Stir in pasta and cook 5-7 minutes, until noodles are soft.